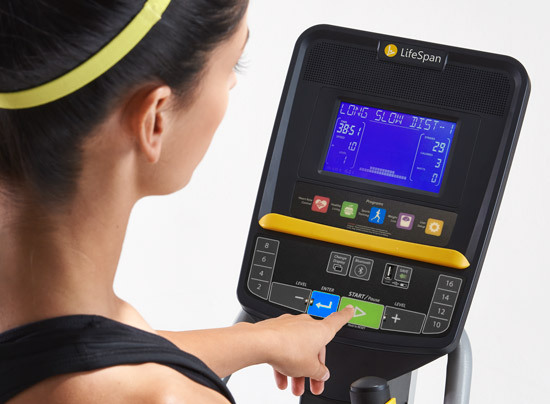 The latest elliptical in the LifeSpan lineup is the new E5i, introduced in 2019 and catering to the user who is looking for a more club quality option for their home gym. Joining the popular E2i and E3i, this one gives you a bit more than the others, making it a great choice that competes with entry level models from brands like Life Fitness and Precor. The LifeSpan E5i is built strong and durable, with commercial-grade components and upgraded features. It shares the jet black design with yellow accents like the rest of the lineup. The E5i is the first new elliptical trainer that LifeSpan has introduced in some time. It looks like they are trying to compete with the higher end brands like Life Fitness, although it will certainly be an uphill battle. At around $2,000, the E5i is definitely pricey, about $700 more than the mid-level E3i and $1,000 more than the entry level E2i. Time will tell if customers are willing to cough up that kind of money for a LifeSpan elliptical. Still, it does have a lot of good features and capabilities. It's essentially a beefed up version of the E3i, and shares many of the same specs. You get a basic but functional LED display showing you all of the relevant workout specs like resistance level, heart rate, distance, calories and time. It also has a media shelf for your tablet if you prefer to watch a video or show while you're working out. The LifeSpan E5i has a nice variety of workout programs to choose from, 21 in all, including weight management, healthy living, sports training and heart rate, so there's plenty of options for you regardless of your fitness goals. There's a generous 20" stride which should be ample for most users, and 20 different resistance levels for your manual workouts. You can start low and see if you can work your way up over time to challenge yourself. If you want to track and sync your workout results you can opt for the Bluetooth Adapter, which allows you to link up through the LifeSpan app to your favorite fitness apps. It costs around $30 for the adapter. It would be nice if Bluetooth capability was built into the E5i as it is on many other elliptical trainers in this price range, but it's not a big expense if it's something that is important to you. Other nice touches include the multi-position handlebars not available on the E3i or E2i. You also get transport wheels for portability, audio jack, speaker system and a very generous warranty: lifetime frame, five years parts and two years labor. 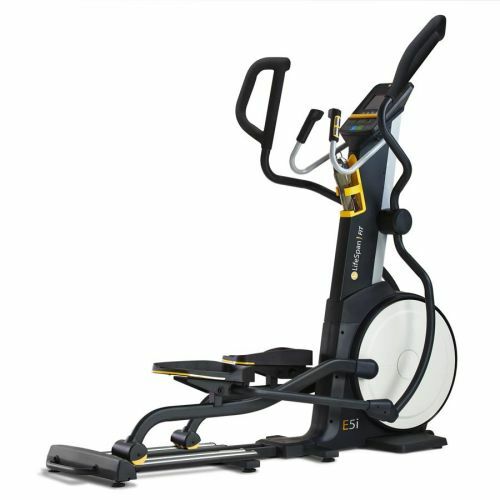 The new LifeSpan E5i elliptical is a welcome addition to the lineup, as it gives customers a more durable option that can stand up to heavier workouts that the E2i and E3i can. It has a ton of built in workouts, lots of resistance levels, a generous 20" stride, optional workout tracking, strong warranty and other great features. Still, at just under $2,000 it's competing head to head with some of the higher end ellipticals from NordicTrack and Sole, and the entry level models from Life Fitness, Precor and Matrix. So it certainly has a lot of competition in the field, and it will be interesting to see how it plays out. We'll keep an eye on this one and let you know if it picks up steam as time goes on.